We can not believe how quickly the term is going. Thank you to the parents who have been helping out with our reading roster. we are really seeing the children''s enjoyment of reading improve. In class we are continuing to work on the children''s letter and sound knowledge. we are also spending time explicitly teaching correct letter formations. we are also continuing our weekly guided reading sessions and for writing will be focusing on procedures over the next few weeks. In maths we are continuing to focus on developing number sense and counting. We have been practising skip counting and simple addition using number lines and simple partitioning. Over the next few weeks during our outdoor learning time we will be exploring some games from the past as part of our history focus. If you have any games from your childhood that you would be willing to share, lease send them in. Just a reminder that every Tuesday is our open classroom where you are more than welcome to come inside our rooms and spend time with your children until the first bell goes. We would ask that you not come in on the other days as the morning is a very busy time for us as we try to spend time with individual children listening to reading and practising their sight words. If you do have any queries please send us an email or make an appointment. We hope you all have a good week. Welcome to our first blog for the year. We will be regularly adding to our blog letting you know what is happening in year one. We are very happy with how quickly the children have settled into the routines of Year One. we thank you for your support with this. Thank you to all of the parents who attended the parent information evening, we hope that all of your questions were answered. Our homework has begun this week. Please remember to sign the reading record sheet which is attached to the back of the homework book. Our parent roster will begin this week. If you are able to help by hearing some children read in the mornings, 8:15 am-8:40 am please add your name to the roster sheet found on the inside window. Over the next few weeks our focus in literacy will be on sentence structure, correctly using full stops and capital letters, as well as increasing our letters and sound knowledge. In maths the focus continues to be on number sense, skip counting and we will begin using some simple addition strategies. The children have been enjoying EduDance and they will begin Blu Earth this week. Just a reminder that next Tuesday, 21 February is a pupil free day. We hope you have an enjoyable week. We have had a very busy couple of weeks with many events on, such as our Liturgy and excursion. Thank you to everyone who came along for both of these events. The children certainly appreciated having you there. This Friday night is the annual school Christmas concert. Year One will be performing a song in collaboration with their buddies in Year Five. For any further details please refer to the newsletter. Thank you to all those parents who have been encouraging their children to be more independent. We have really noticed a difference. A reminder that our Prayer Service is next Wednesday beginning at 8:45am. All parents are welcome to attend. This week a note will be going home about the excursion. We ask that you return the permission slip as quickly as possible to help us with our planning. During outside learning time as part of our History unit we are reflecting on the past. The children will be making memory bottles. The children have been asked to bring in a plastic bottle with a lid for this activity. Well,it has been a long time since we last spoke. Our BLOG is finally back up. Term Four is always a busy term. This term we are encouraging greater independence from all of the children. This includes carrying their own bags, coming into the classroom by themselves, knowing whether they have an online lunch order or crunch and sip. delivering messages to the teacher and perhaps even trying the afternoon pick up area. Week Seven is particularly busy with our class Prayer Service and our excursion to Mills Park. Parents are invited to join us for both of these occasions. We will send out more details closer to the dates. We have been very happy with the number of children reading every night to an adult in their house. We would like to encourage you to continue this practise until the end of the year, even though we are all getting busy and the term is coming to end. Thank you to all of the parents that have sent in items for our tinkering and collage areas. The children have shown their creativity and perseverance as they have worked in these areas. This week we have added additional construction equipment for the children to test their skills with. 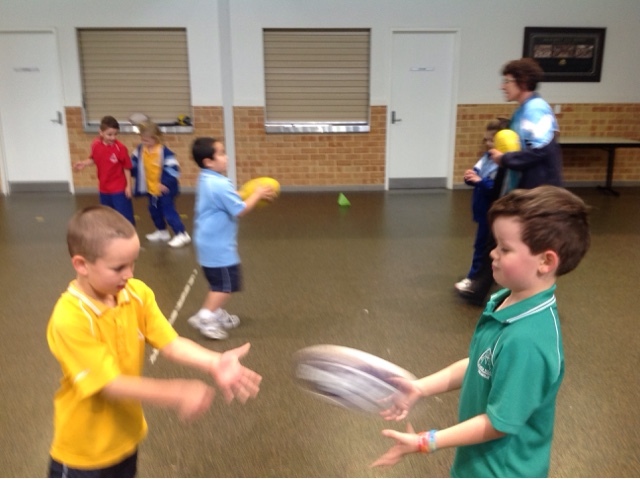 To start the term in Year 1 we have focused on co-operative learning through Physical Education. The students were broken into small groups and completed a variety of challenges. 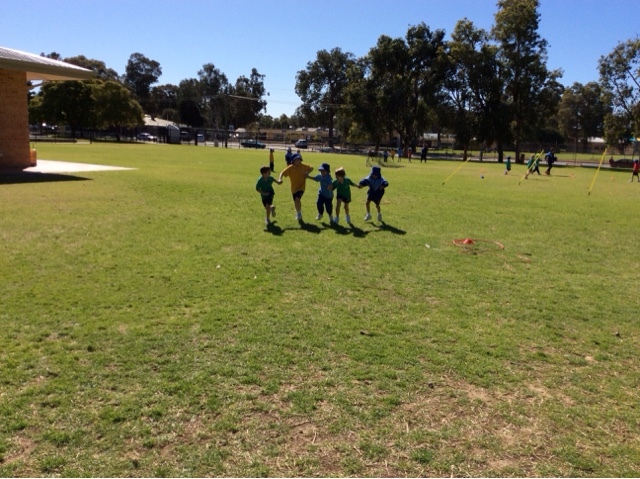 The challenges included a variety of skills that they will use in the athletics carnival such as throwing, catching, sprinting and team work. They also learnt some new skills such as cup stacking, wheelbarrowing and hurdling. We now move onto learning the team games for the carnival and practising our sprinting. 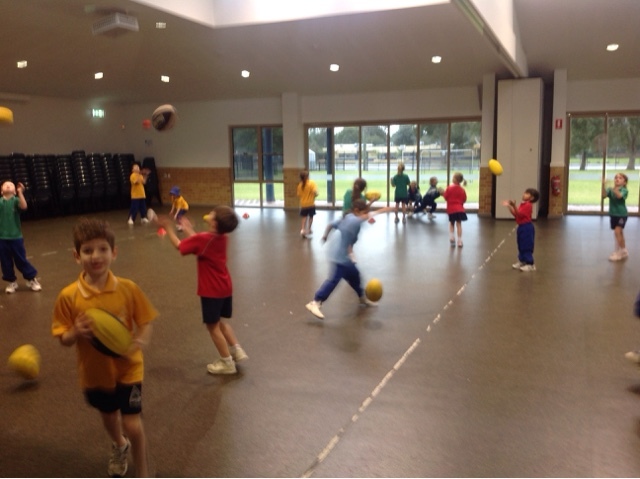 This term in Physical Education we have been concentrating on kicking through the sports of soccer and AFL. 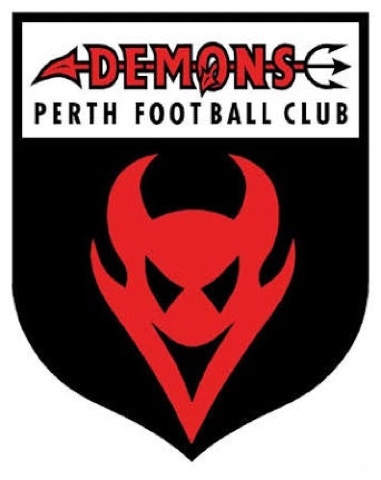 Last week we were lucky enough to have the Perth Demons come a visit to do a clinic with us. We have also learnt how to handpass the ball and loved playing football dodge.